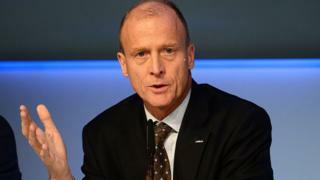 Image caption Airbus chief executive Tom Enders says the UK govenment is "going in the right direction"
The UK government now appears to be moving in the right direction on Brexit and the EU should be "similarly pragmatic and fair", according to Airbus chief executive Tom Enders. Last week he said UK ministers had "no clue" how to exit the EU without harm. Airbus had warned it could pull production out of the UK if it leaves the customs union and single market without a transition deal. On Friday the UK cabinet agreed a new approach to its Brexit negotiations. Airbus employs 14,000 people in the UK, including 6,500 in Wales, mainly producing aircraft wings at Broughton in Flintshire. The deal made at Chequers led to the resignation of Brexit Secretary David Davies and subsequently Boris Johnson as Foreign Secretary. But Mr Enders' latest statement, says "HM Government are going in the right direction." Speaking at a German-British chamber of industry and commerce event in London on Monday, after the Chequers deal was made public, he said: "We are not shy to request that Brussels and our other home countries are similarly pragmatic and fair." Brexit plan: Was it business wot won it - or lost it? Many Airbus employees from Wales also travel to the manufacturer's Filton plant in Bristol, which employs a further 3,000 people on wing assembly. A further 2,500 work at sites in Portsmouth and in Stevenage. It is estimated the aviation giant supports about 11,600 jobs in Wales alone in its wider supply chain.